Contrary to what many people think, animals under Endangered Species Act protections are not fully funded by the federal government but by the state in which the species lives. Brian Nesvik, the Wyoming Game and Fish Department Chief Game Warden, said the department has spent over $50 million managing the animal since the grizzly bear was put on the list almost 40 years ago. "It comes from the commission's budget, and the Wyoming Game and Fish Commission budget is about 75 percent hunter and angler dollars," said Nesvik. 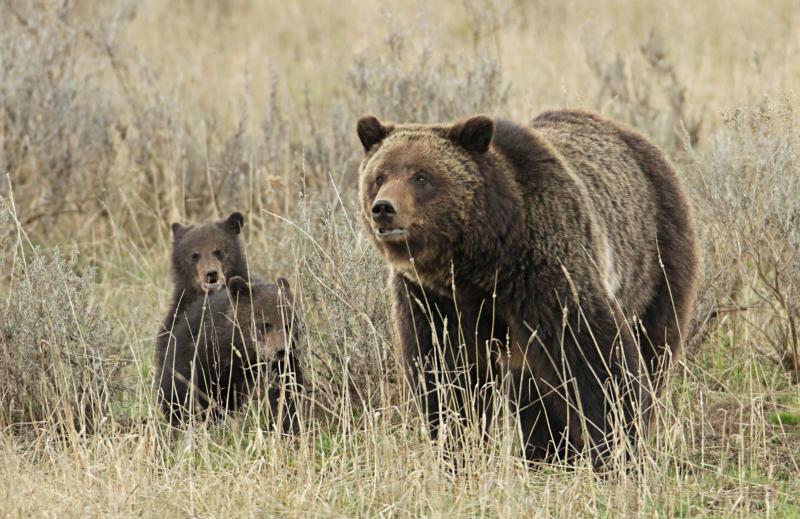 Nesvik said the federal government only contributes about five percent of the funding toward the grizzlies' recovery, which means Wyoming hunters and anglers foot the bill. "Thanks to their efforts the species has recovered. There is….there's extra bears, there's opportunity." That opportunity? Hunting. Jackson resident Lisa Robertson is a wildlife advocate. She said federal protections for the grizzly are not just a Wyoming issue. "It doesn't fly anymore with the public," said Robertson. "The tourists that came here that watch animals do not want to see those animals trophy hunted for any reason." Robertson said the "Shoot'em with a Camera" initiative where thousands of people applied for grizzly bear hunt licenses to hunt with a camera proves that there is a group of people who are willing to contribute to the department but don't want to hunt or fish. "They [Game and Fish] need to respond to those people and react. What are they going to do with these people now that are signing up to be involved or to donate to projects that are not related to trophy hunting?" said Robertson. The current funding model for wildlife management is known as the North American Model of Wildlife Conservation. It is a set of principles that have been followed since President Teddy Roosevelt's time, and it basically says it's necessary to protect wildlife to ensure a viable population to fish and hunt. This includes hunter and angler license fees but also federal excise taxes on hunting and fishing equipment. For Joe Kondelis, the president of the Western Bear Foundation, this model works, but he also agrees that the Game and Fish Department needs more diverse funding. However, he is worried that allowing non-consumptive users will change the way things are done in Wyoming. "Why else would they want to spend the money?" he asked. "They want to spend money to influence decisions. That's it." Ryan Lance, the chairman of the governor's task force on fish and wildlife funding, said it's a tricky issue since licenses don't generate enough revenue since Game and Fish manages more than just game species. "If we're going to be able to maintain state lands, if you're going to be able to maintain an enhanced recreational opportunity in the state, there's going to have to be a broader pool of funds to draw from," Lance said. Lance said it's been difficult to find consensus on a solution, noting that excise taxes on outdoor equipment and non-consumptive user conservation stamps are among the suggestions to generate revenue. The legislature has not been part of the solution. It has rejected using additional state general fund money for Game and Fish, and in 2017 it cut existing state funds and increased all license fees to compensate. State Representative Albert Sommers said Game and Fish does need new revenue sources. "I do believe there are certain issues out there, certain species that because of court cases and national attention on them, there should be national dollars put towards them," said Sommers. The Wyoming legislature passed a resolution last legislative session asking the National Park Service and neighboring states to look at creating a wildlife user fee for people that enter Yellowstone National Park so that they can possibly get those federal dollars. But while Sommers wants the federal government to contribute, he doesn't want Wyoming to lose control of management. In the next week, look for more articles digging deep into the conversations around wildlife conservation.